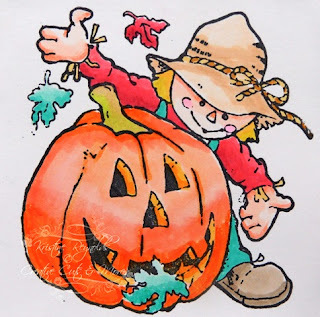 Now that my kids are grown I don't get too in to Halloween and sorta hate the hassle of the trick or treater's because my dog just barks all night and the bugs fly in the house every time I open the door but I do still decorate my house and I love all the cute images available for stamping! 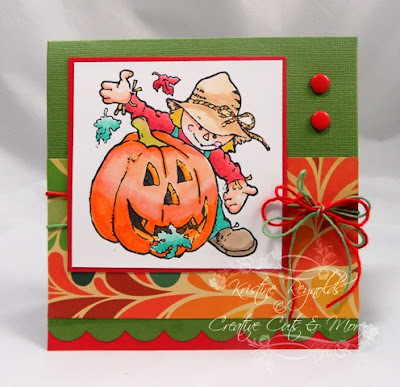 So in the spirit of the day I just had to share one last Halloween card with you! I started with a 5 1/4" Square Scallop Card from Creative Cuts & More. These are fabulous die cut cards to start any project with. They come with the scallops all ready cut and the fold line scored. I hope that you have a terrific Halloween however you celebrate! 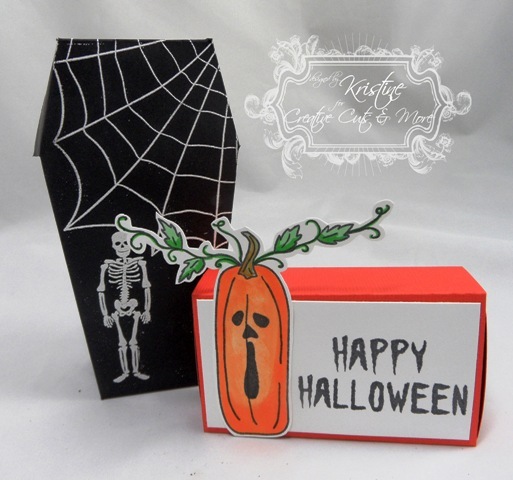 Although many of us got snow last night, it's still the Halloween season, so I thought I'd share another quick Halloween card today using the Slash Pocket with Tag #05 set. These are super cute and are great for gift card holders too! 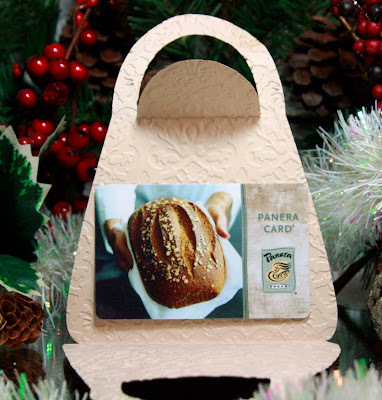 You can just add a little notch for the gift card on the back of the tag, or attach it with repositionable tape. I hope you are staying warm and dry wherever you are today! It's a great day to go shopping for your holiday project needs! Happy weekend! 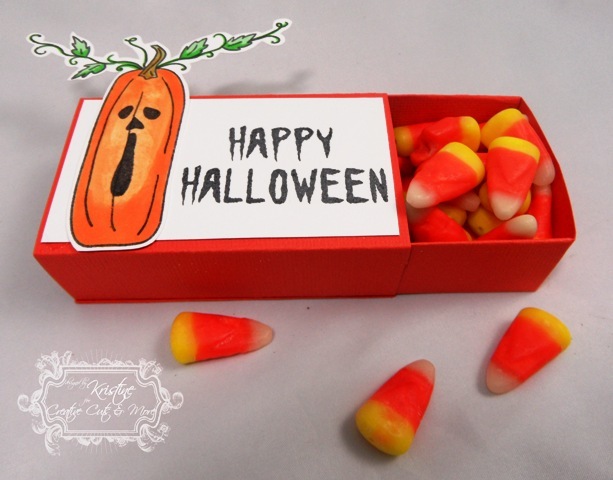 Nora Anne here today with a quick little Halloween card! Ever since my little guy started Kindergarten, I feel like I am SO busy, with homework and activities, birthday parties etc! That's why I love the A2 cards from Creative Cuts and More, they make it so easy to make a card in no time! Especially for those last minute birthday gifts! 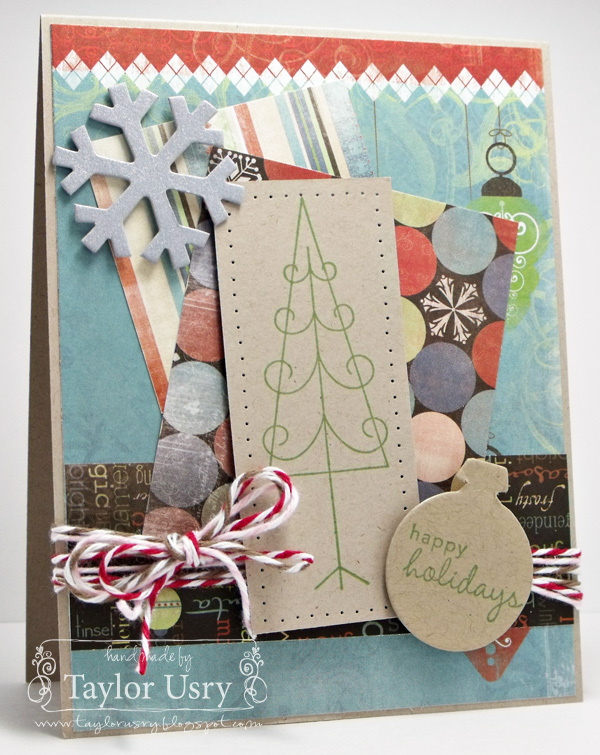 This one is a Neenah A2 card base, pre-cut and scored for your convenience! 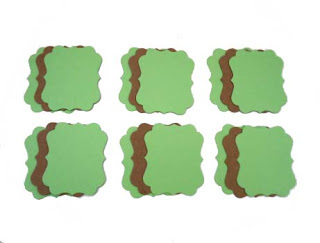 I love stocking up on these and all the other fun die cuts at Creative Cuts and More! 5 Minute Faux Leather Purse! Hi! Dawn Lusk here... a tad late, but hey, it's my birthday, I'll blame it on getting forgetful in my "old age" LOL!! In order to still make a post today, I had to think of something quick and easy. With the holidays coming up (or any occasion for that matter! ), I went to my stash of Creative Cuts and More goodies and found this Purse A2 Card. 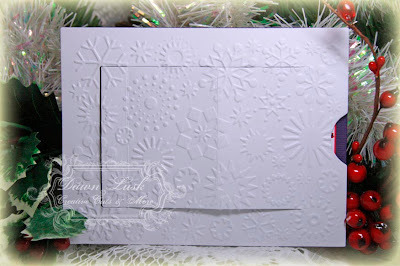 In just 5 minutes I was able to create this darling faux leather gift card holder! All I did was run my Purse through my Cuttlebug with my Kassie's Brocade embossing folder, drag my Brushed Corduroy distress ink over it then, using a sponge, I added some Pumice Stone distress ink. I took my Versamark pad and "smooshed" (technical stamping term!) all over, sprinkled with clear embossing powder and heat set! Voila! You could add a button as a faux closure too. Easy peasy... everything from CCM comes pre-cut and scored, giving you lots more creating time!! Hi Everybody! It is Noelle posting today and I am obsessed with the Filigree Rectangle Label. It's my favorite. You can order it all by it's self like I did in pink. You can order it in a Filigree Rectangle Window A7 Card - Vertical or Horizontal . It even comes as Filigree Rectangle Mini Album & Chipboard Set! I will be ordering that one next! 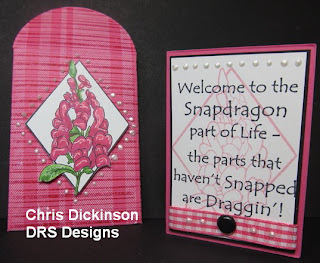 If you want to see all of the Filigree Rectangle items we have available click HERE. Hi everyone, it's Taylor here again today. I'm sharing another holiday card I've added to my pile - I try so hard to get ahead with these before the holiday rush sets in. Yesterday I realized that November starts next week - yikes!!!! 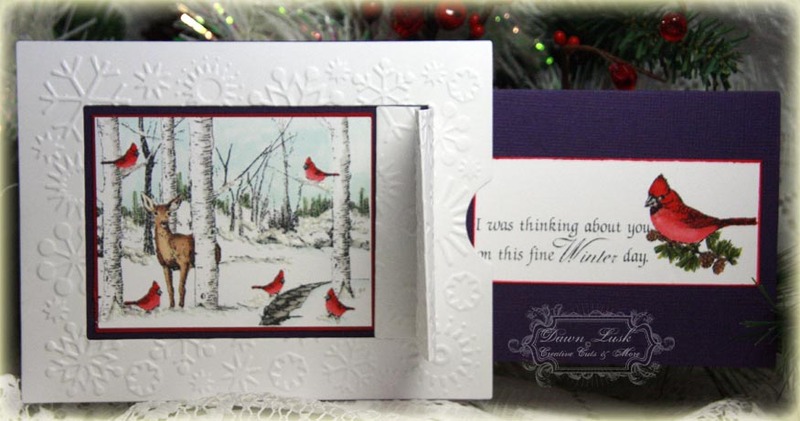 The sentiment on this card is stamped on a die cut ornament from Creative Cuts and More. Specifically, it's part of the Christmas Ornaments #02 mini ornament set. 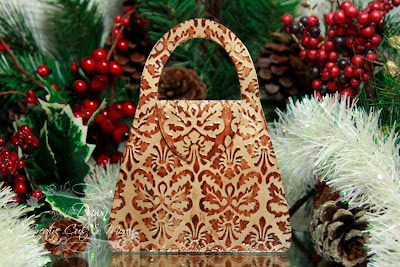 It comes with four ornaments, two of each style, in whatever color you choose. My pretty silver snowflake came from there too - it's Snowflake #01 mini, and also comes with four little die cut snowflakes in it. Both of these are perfect accents for holiday cards, don't you think? I know I'll be using tons of them this season! Coffin Box ~ Spooky with a touch of Elegance! 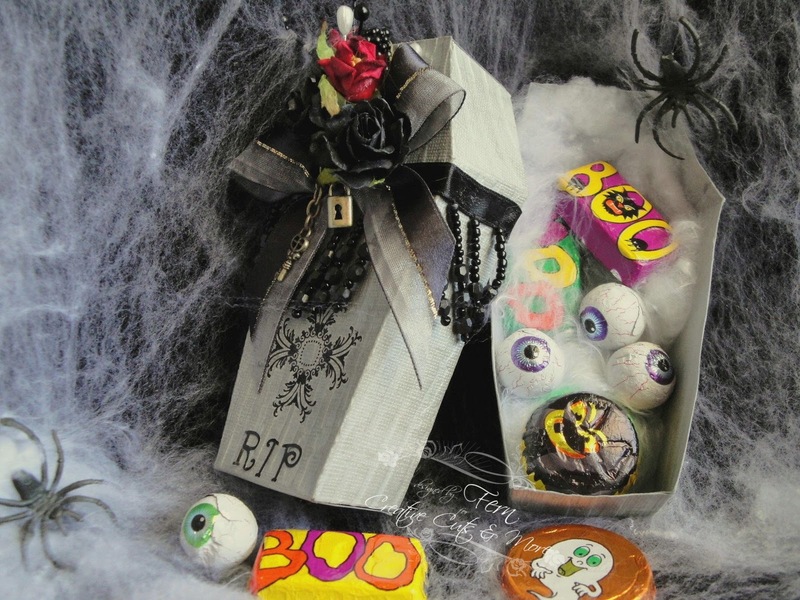 Hi everyone, Fern here with today's spooky reveal!! 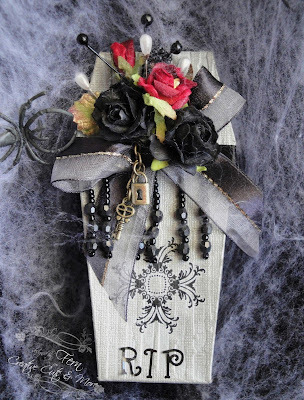 With Halloween just around the corner I wanted to share with you this cute project I've made using the Creative Cuts & More Coffin Box .. ﻿ I've embossed it with the Cuttlebug Distressed Stripes Embossing Folder and then went over it with Tim Holtz Pumas Stone Distressing Ink. I decorated it with leftovers in my stash from scrapbooking kits I have received in the past .. These are so easy to assemble since they already come scored.. And the best thing to hold them together is Creative Cuts & More Killer White or Red Tacky Tape. After you fold and tape the sides you are ready to decorate.. You can do a little or a lot that's totally up to you... When that's done.. just add candy and now you have a cute treat favor box that any goblin would love!!! 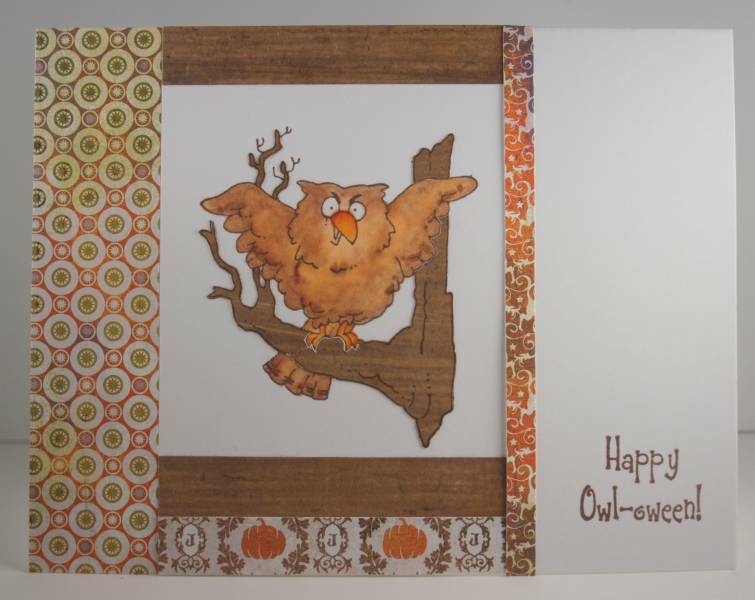 Now why don't you head on over to Creative Cuts & More where you can save a lot of time by using their die cuts to create your projects. They carry Die Cut Shapes, Hardware and Tags to add to your scrapbook layouts or card making projects. 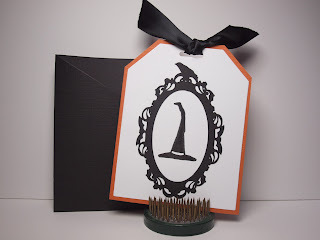 They also carry wonderful die cut cards with all styles of window openings, die cut bags and boxes, as well as unique 3-D die cuts that can be used for all kinds of occasions. So what are you waiting for... Check 'em out!! Yes, that title says it all. There is a great die cut album from Creative Cuts and More called Castle Mini Album & Chipboard Set. I decided to do a project with three of my friends using this album We all started with four pages-two acetate and two chipboard. We all purchased the Wizard of Oz paper in 8 x 8 to work with. I made a few extras to slip in between the pages. This is a close up of my favorite page. Next I have another version my friend Mary made with the same castle album. This is the album stacked together. Mary used the faces of her family members in many of the characters. This is the front and back of the first page. The second page-Guess which character Mary used for herself? This is such a fun page-both sides! This is the last page, I think she did a wonderful job-What do you think? as inspiration- you know you can order any of the mini albums and make a class for you and some friends. Welcome! Danielle and today I have my giftbox that's perfect for a small toy. I put a matchbox car inside since it's the Match Box Die Cut. The recipient can just slide the box out and see what little present is inside. So glad you stopped by! 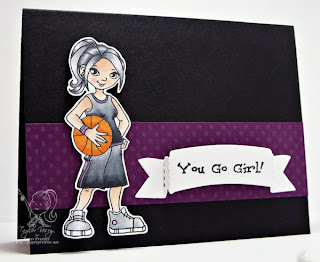 Today, I am sharing a project using Gift Card Set die cut from Creative Cuts and More. Accessories: Viva Pearl Pen, White Gel Pen, Copic Markers, Paper snips, Dimensionals, Basic Grey Brads, Pink Gingham ribbon from Really Reasonable Ribbon. Dawn Lusk here, sharing an easy yet... did she spend all day making this... Winter card using Creative Cuts and More Sliding Pop-Up. You can choose which way you want your card to "open", I chose sliding to the right to accommodate my images. It's so easy with everything coming pre-cut and scored! These are a real favorite of mine...which reminds me, I need to go shopping at Creative Cuts and More and place an order! This was my last Sliding Pop-Up!! Hi Everyone, it is Noelle posting today! I don't know about your house but at our house every year we decorate a gingerbread house. We have never figured out why our grocery store sells them in the produce department but they do! I think this year we will need 2 because my youngest will be 4 and ready for her own! That will be perfect for lots of messy pictures! Every year I decorate the Gingerbread Man #02-Large from Creative Cuts. He is so perfect for a scrapbook page! Or even a card. I wish I would have waited until the Stickles were dry to take a picture. Her mouth really isn't all you see when you look at her now. LOL I can't wait for next year I will have Carlee write her Christmas cards on one side for all the teachers and then we can decorate the other side! Thank you for stopping by today, we sure appreciate it! Hey everyone, it's Taylor here today! I am absolutely in love with these Banner #01 (small) thingamabobs (yes, that is a technical term!). They make adding a sentiment so easy - who doesn't love easy? On this clean and simple card I started with the Banner #01 from Creative Cuts and More and stamped a sentiment on it. I folded the banner along the pre-perforated lines, but you certainly don't have to. Or you could fold it and tuck those ends more underneath (instead of popping it up so much like I did). Either way, it's a great way to make a statement! I thought I would share a couple of cute ideas for giving out goodies to those little special kids in your life. Both of these boxes are die cuts from Creative Cuts & More. This one is Matchbox #01 Large cut from Orange Bazzill Canvas Textured Cardstock. I decorated it with stamps from The Rubber Cafe. This box is the Coffin Box which I had cut from Black Neenah cardstock. I embossed the images from The Rubber Cafe with white embossing powder. 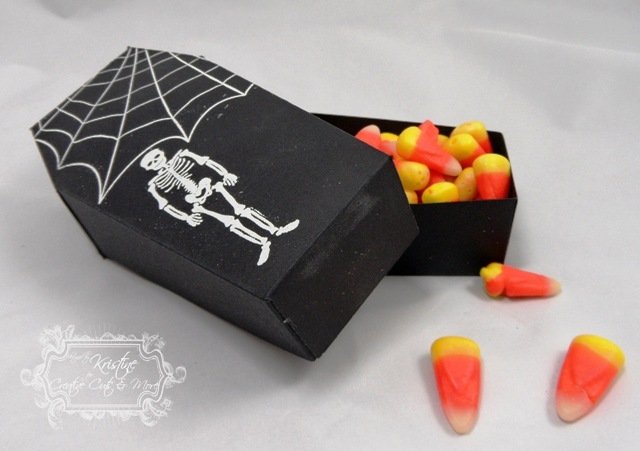 Both of these would be a lot of fun to send in to your child's classroom for a Halloween treat! They are quick and easy to make and go together easily with some Killer Tacky Tape. I hope you liked my projects today! Rectangle Accordian Album - to do list! Danielle here, with my project that I made for my son. In the mornings things are rushed and this helps him not forget what to do. The Rectangle Accordian Mini Album was perfect for this. I added a title and now we have much smoother mornings. Won't You Have Lunch With Me ? I made a napkin and a place mat, and a chair name tag just for you! All of these shapes were cut from Velvet paper in some of the best fall colors around. Did you know that Creative Cuts and More has velvet Paper? You can have almost all die cut shapes cut from this great medium. I used a wonder under fabric adhesive to attach to the place mat and Napkin. All it took was a warm iron on a hot setting and no steam. I decided to use a couple stamps to decorate the pumpkins and a few leaves. Stazon ink works best on this felt paper.Didn't have any problems with bleeding or smearing. Chair Box & Place Card. Thanks for stopping in ,hope you enjoyed our time together.Hope I gave you some inspiration to decorate for your home. I Am Batty Over You!